Say the word “woodcock” in a room full of bird hunters and you are likely to capture most everyone’s attention. Hunters are fascinated with the eclectic, migratory bird for a wide variety of reasons. Dyed-in-the-wool woodcock hunters seem to have camaraderie that knows no bounds. I suspect if you asked any of them if they’ve ever wanted to embark on a five-month journey that follow the flights from their breeding grounds to their wintering grounds most would say yes. Most nod in agreement when the phrase “anything done in moderation shows a lack of interest” is quoted. These remarkable woodcock trade back and forth on a seasonal basis from their Northern breeding grounds in Eastern-through-Central Canada to their winter roosting grounds throughout the Southeast and the South Central regions. These vampires loaf during the day and fly at night, preferably on the bright sky characterized by the October Hunter’s Moon. Long elongated beaks pry earthworms from the moist soil found along seeps and river bottom. The thicker the alder tangles the more birds you’ll find, particularly during a dry year. Sometimes I think woodcock prefer these areas because their brains are upside down. I suspect that adds to some confusion including migrating at night. Hunting woodcock isn’t so much about big bag limits as it is about carrying on a tradition. It is true that many bird hunters have the woodcock on their bucket list, and this is also very true: once that box is checked off their list they will never want to hunt for them again. Some say it’s not fun wading through the dense coverts, others complain about the gashes and cuts incurred along the way. 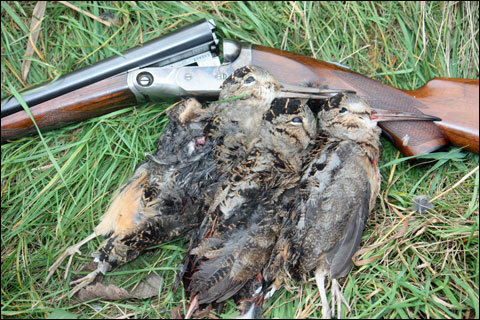 Shooters who go on long strings of misses want to wrap their gunning irons around trees or throw them in the river. Depression sets in on bird counts when the flights on a limit are easily filled while dogs are still pointing. In between flights there are few birds, and that can make for a long day. It’s thick in the early season foliage, hazy hot and humid to boot, and when the leaves drop the cold winter wind whips through the coverts. I’ve felt those same feelings throughout my long career chasing timberdoodles and have concluded this one point: woodcock are my favorite game bird, period. The author with Rowdy, an Orange Belton English Setter. What ties us all together is the fascination of hunting a bird that we just can’t quite pin down. 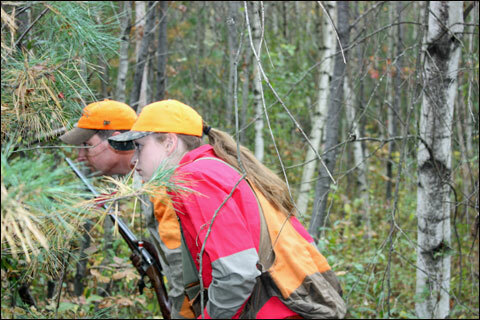 We can identify patterns, and we do that in fact by talking with other hunters. We talk about local birds, flight birds, migration patterns, and the oddities we observe. We talk about wet years and dry years and semi-wet years and semi-dry years and all points in between. We talk about finding birds under the pine boughs and along seeps when first snows of the season arrive, and the latest times we’ve found birds. We look for clues that give us insight into patterns, and we run down those clues like the detectives we are. We wonder why some coverts are hot and why others are not, and we are befuddled as we try to predict where the birds will be. Every year we look forward to revisiting our old coverts, ones that we have hunted over time. Every year we look forward to exploring new coverts to see if there might be more birds than our current holdings. We name them to keep their location hidden and safe. The Gold Mine was one that had 30 birds on our first hunt. Black Dog after the farmer who has a Labrador and still gives us permission to hunt. Covered Bridge in honor of the way we get into the covert. Gray Hair because of the time when our dogs ran so poorly that we all added some gray to our locks. It’s fun coming up with names for new ones, and it’s fun reminiscing about past times in old coverts. The only part that we don’t like about the past is when we realize how old we really are. The moment of truth comes when a dog’s flagging point locks up. Watch and wait. 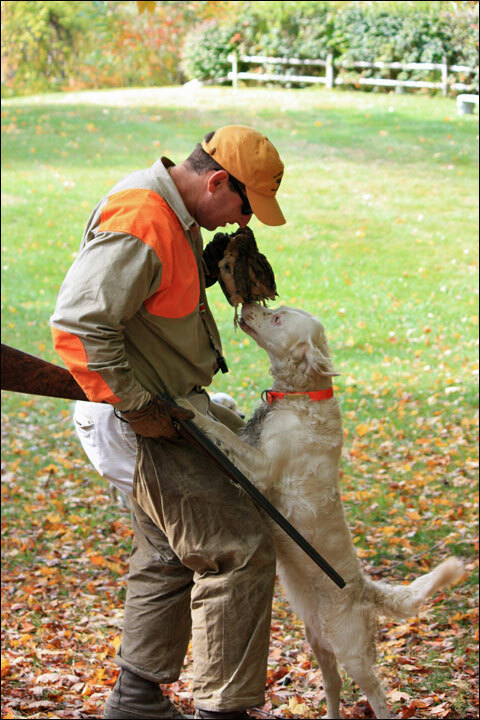 The author here with hunting companion, Morgan Wolfe. Those feelings pass, because woodcock make us feel like kids again. We site statistics of points, flushes, and bird counts like kids chronicling ERA’s, batting averages, and RBI’s. We wonder where the birds are and when or if they will arrive in our coverts. We anticipate their arrivals, just like we anticipated our last day of school before summer vacation. And we are sad when they are gone. I haven’t done an accountant’s overview on page counts, but my gut feel is that there have been more pages written about woodcock and Ruffed Grouse than any other birds. Burt Spiller. Tap Tappley. Bill Tappley. Corey Ford. Gorham Cross. Frank Woolner. William Harnden Foster. The list goes on. Maybe it has something to do with the fact that they lived during the time when our agrarian society was transitioning fully into the industrial age, and that there was no shortage of primary and secondary growth favored by upland birds. In one chapter of Gorham Cross’ “Partridge Shortenin'” I did a flush count; and in an all-day hunt the cadre of three bird hunters moved 105 grouse. A 20-bird day is sort of today’s benchmark as a solid day. Back then they didn’t really place a tremendous amount of focus on woodcock, which far outnumbered the pats. 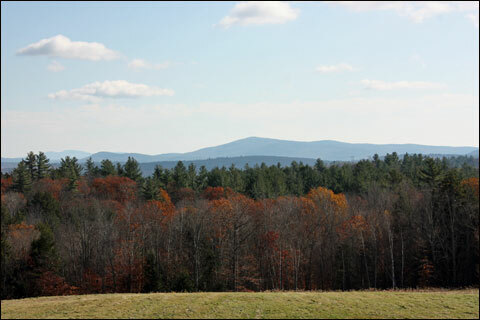 Looking across an old farm field and seeing wide-open space is a woodcock hunter’s dream come true. Some upland bird hunters consider the woodcock, also known as the timberdoodle, bog sucker, or mud bat, to be the inferior upland bird. A grouse will run until it’s forced to fly. A grouse will run through the thickest, nastiest upland coverts characterized by bull briars, bittersweet, raspberries, hawthorns, Mountain ash, high bush cranberries, and apple trees. A woodcock is considered a Gentleman’s bird. They’ll hold tightly for a dog. Their flight plan is a fairly predictable tower-and-go. They favor manageable runs of alder, poplar, and white birch. In a dry year you will find them in the thickest of tangles that make any non-covert dog run for the hills. In a wet year you’ll find them in the uplands on a sweeping hillside covert with a seep or a feeder stream winding its way down to the main stem of the river. Resident birds conduct their business like any other game that is well acquainted with the forests. They have well understood escape plans and they use trees and leaves to their advantage. They zig and zag and, like a grouse, seldom present a gunner with a good shot. We use cylinder bores and light loads for better pattern spreads that help. That said, we cuss a lot, too. 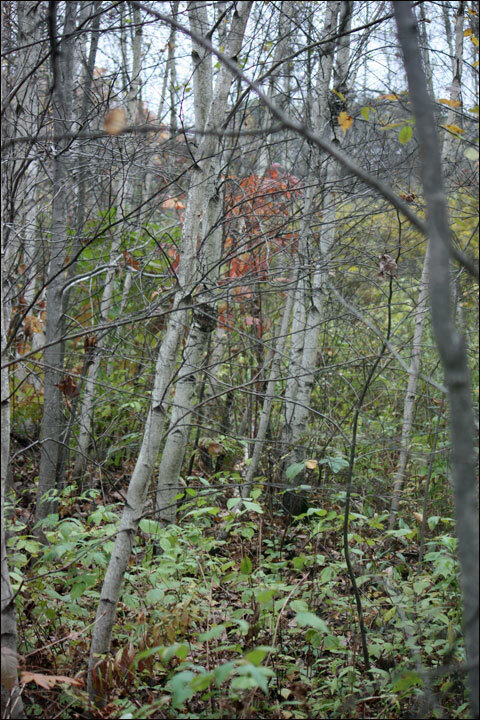 White birch runs are among the woodcock’s favorite haunts. 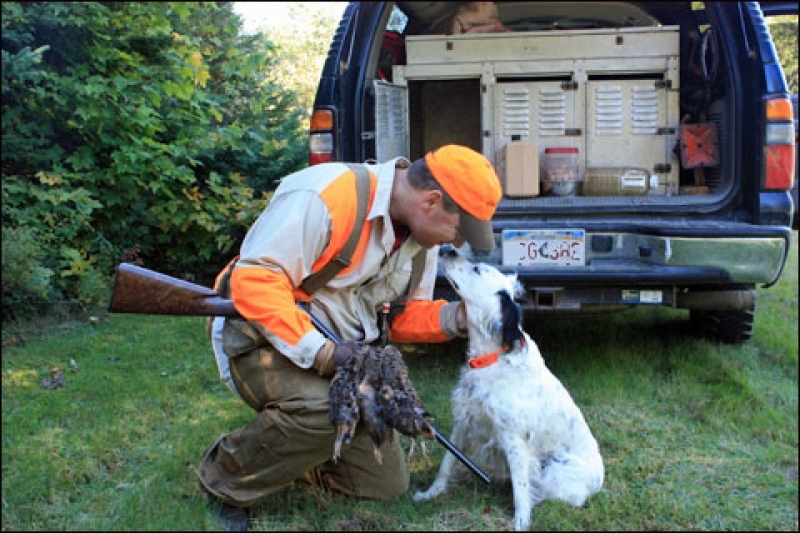 We woodcock hunters represent probably the smallest number of upland bird hunters. I believe that pheasant and quail occupy the number-one and two-positions, respectively, but we make up for our low hunter numbers with passion and zeal. If you engage us be sure to have a comfortable chair and a tumbler of bourbon, for our devotion to the bird is like our passion for the land we hunt: we won’t quit. Good luck if you think you’ll learn where we hunt because the odds are you won’t get anything but a general clue. There is a reason we call our hunting areas “coverts” and we protect them with the same intensity that a captured spy guards national secrets. I think that woodcock are either in your blood or they are not. Why else would someone trade in the soft grasses for hawthorn’s that pierce double tin cloth? Why would they swap open space for lots of trees that interrupt a swing? Why would they keep a leash of dogs all year long for a 45-day season (that was only 30-days up till a few years ago)? I don’t know the answer to those questions, but on Opening Day you’ll find me in the woodcock woods. I’ll be the one hunting hard, trying my best to figure it out. Tom Keer is an award-winning writer and regular contributor to over a dozen magazines and blogs. His favorite time of year is in October and November where you can find him in woodcock and grouse coverts or quail fields with his wife, two kids, and three English setters. Visit him at www.tomkeer.com or at www.thekeergroup.com.